Riders who like to ride on land, snow and water. The new Chrono V2 is more stable, less technical kitefeel and better tuned than the older model. More stability and easier to handle! We had great fun combining the Chrono V2 15m with a hydrofoil. You ride and jump in 5 knots of wind. We tested the Chrono V2 in offshore gusty winds next to a tube 15m kite with 28m lines. The Chrono was by far the stable one and the only one that was able to relaunch from the water! Chrono V1 vs Chrono V2. We believe the new Ozone Chrono V2 is better tuned and easier to ride in a wider range of conditions. The V2 is more accessible to a wider public of kiters. I've been flying the Chrono2 since their launch and previous to that, Chrono1. I chose the Chrono because of the build quality (Compared to Flysurfer) and high power delivery through virtually any depower setting (at 133kg I need high power consistently). I fly my 13 15 18 Chrono2 in various conditions, wave, flat and even heavy rain (which kills the response time as expected) and they out perform most other LEI's on the ocean, in speed definitely, boost height usually, and amazing upwind capability. I only twin tip using CARVED and CORE boards, also a 170 2017 Flydoor in the mix. The biggest issue is 'Water Relaunch'. If the kite hits the sea they drink the water up like a fine wine. If they're in the ocean more than 1 minute, you're in trouble. By the time you get to the shore (more like dragged) it's usually carrying a half kite full of sea and 5-10kg of sand. Not good. My kites usually don't hit the sea however, but sometimes if I boost without finding the kites sweet spot (don't properly dial in) then there can be trouble. All that said, the performance outweighs the pitfalls, and very easy to travel over seas with. It was the first time for me using a foil kite as I'm usually kite with a tube kite. I tested the Ozone Chrono in combination with a flyboard on a hard sand beach on Schiermonnikoog Paal 3. Compare to a tube kite the Ozone had an great and smooth lift what makes the kite perfect for making low jumps with a long airtime. Subsequently the Chrono is beautifully moving through the air and gives a relaxed impression. However the timing in jumps is quite specific and completely different compare to tube kites. 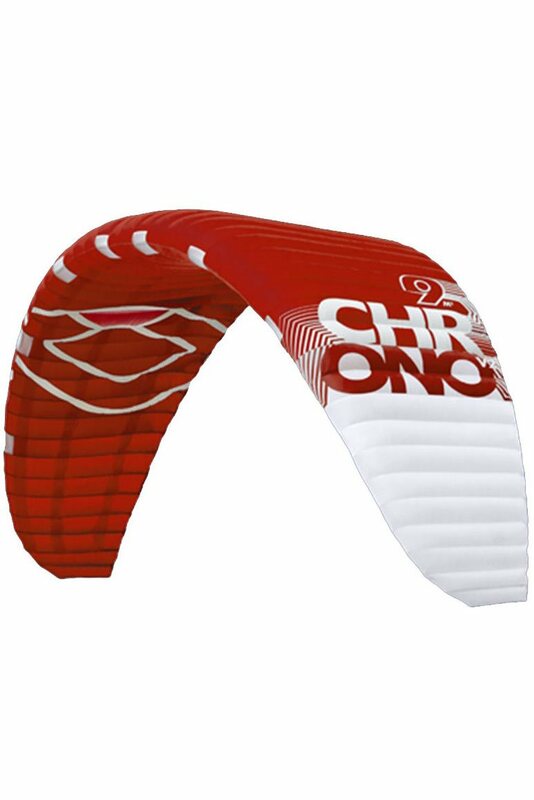 All in all, the Ozono Chrono is in my opinion a great kite for light wind sessions and long airtime. Thanks for testing the kite! Had a great session with the Ozone Chrono V2 15m in very light wind riding a hydrofoil. This combination is great. The long powerful strokes of the Chrono give you enough time to waterstart and start foiling. We also tested a Tube kite 15m with 28m lines. Foiling was possible, but in the 5-7 knot range the tube kites are too heavy, you can't relaunch them when they hit the water. The Chrono was still relaunch-able. So great low-end and great relaunch for the Chrono. The V2 stands for the second kite serie and the most important new feature is the stability. No wing tip collapses any more, like the older V1 had. What surprised me was the possibility of jumping. The hydrofoil delvers enough speed & kite pressure to jump. The V2 has enough float to give you airtime for tricks! IN 5-7 KNOTS!!! Crazy combination! Loved it! Had a short ride with the new Ozone Chrono V2. The conditions where pretty high end for the 15m. Big floaty airs as result. The most noticeable compared with the older Chrono is the stability. This is much better. The tips doesn't collapse any more, the kite profile stays steady. Incredible is the upwind performance and Gliding phase. If you like to jump big floaty airs and you don't mind to deliver on turning speed. You have to try the new Chrono V2.